Are you bothered by excess fat that doesn’t respond to diet or exercise? Genetics can often override attempts to lose these problem areas. If you would like to reshape your body beyond what a healthy lifestyle can do, SculpSure may be the body contouring solution for you. SculpSure's light-based body-contouring system treats areas of stubborn fat that seem resistant to diet and exercise. SculpSure may help you achieve the shape you want with a 25 minute treatment and zero downtime. WHY CHOOSE BEAUTY MARX FOR BODY CONTOURING? You'll find many practices that have added body contouring devices to their list of treatment options. If that device is not designed to reduce fat cell quantities (via Apoptosis), rather it drains/diminishes them, you may not achieve a lasting result. ​Your research will likely lead you to look at SculpSure vs CoolSculpting. While CoolSculpting pioneered fat destruction via Apoptosis, it is now outdated technology (please see our comparison further down the page). ​Finally, you've narrowed your options to those who offer SculpSure. Beauty Marx has added SculpSure to our practice, not as just another treatment, but as part of a comprehensive approach to body contouring and improving your overall appearance. SculpSure joins our suite of options such as RF Laser Skin Tightening, Blue Light for back acne, and Permanent Cosmetics & PRP Microneedling to camouflage and/or reduce the appearance of stretch marks or scars from surgery such as a tummy tuck. Whether your goal is to simply look better in your clothes or walk the beach with confidence, our consultation process will give you a thorough understanding of your options and you'll experience why you can trust our team. What is SculpSure? SculpSure is a non-invasive body contouring system intended for the reduction of stubborn fat in areas such as the abdomen, love handles and thighs. The 25 minute procedure may reduce up to 24%** of treated fat cells without surgery. Is SculpSure right for me? SculpSure is ideal for people with trouble spots, particulary those that seem resistant to diet and exercise. How many treatments will I need? Every patient is different. Beauty Marx will develop a customized treatment plan to meet your desired goals. Ask us about the treatment plan that is right for you. When will I see results? 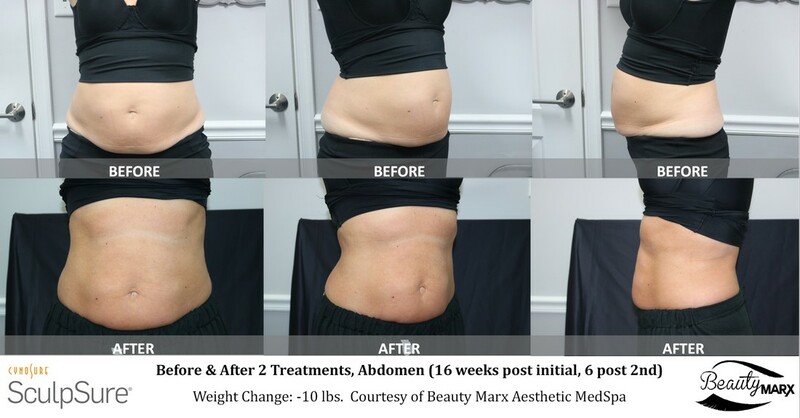 Patients may start to notice improvement as early as 6 weeks following treatment as the body begins to evacuate any positively treated fat cells, optimal results may typically be observed nearing 12 weeks. How long will the results last? Successfully treated fat cells are subjected to apoptosis (programmed cell death) during the treatment. The body does not replace adipocyte cells removed via apoptosis. What is the difference between fat loss and weight loss? The numbers of fat cells (adipocyte cells) stored in our bodies typically remain constant throughout adult life. As we lose weight through traditional means, the size of individual fat cells become smaller, but typically do not decrease in quantity. Even with diet and exercise, many people have difficulty losing weight in trouble spots. Reducing the quantity of fat cells in trouble spots may help achieve a more desired appearance. Thermolipolysis (heat initiated apoptosis) is designed to initiate programmed cell death, the body does not regenerate these cells. Therefore the reduced adipose tissue does not return to the area. Has the FDA evaluated SculpSure? Yes. Click here to see the FDA's comments regarding SculpSure's technical method has been evaluated to result in "the adipocyte cells release fat and lipids resulting in reduction of the adipose tissue" and more. *** Average patient discomfort rating of 3.7 on a scale of 1-10; Bass L, Doherty S. Non-Invasive Fat Reduction of the Abdomen with a 1060nm Diode Laser. Paper presented at: 2015 Annual American Society for Laser Medicine and Surgery Conference; April 22-26; Kissimmee, FL. ****SHARKBITE is a potential side effect reported by some CoolSculpting users where there may be temporary to permanent indentations crudely resembling a shark bite. This is due to a limitation where CoolSculpting can only treat the fat that is suctioned into the applicators, meaning some areas (often near the corners) aren't evenly treated. SculpSure will not produce this result as the thermolipolysis process subtly ceases as the heat dissipates moving away from the applicators, which lay flat.